However, this week we’ve been caught with our pants down as Nintendo has made Gammick Entertainment’s Family & Friends Party available – a title that we’d never even heard of until today! Elsewhere, there’s turn-based action on the Virtual Console courtesy of the classic Super NES release Ogre Battle: The March of the Black Queen. I am seriously expecting this to get a very low score from the graphics alone. Oh, c'mon. PLEASE don't disappoint. I was expecting something of more substance for today. One the plus side, 8 player-support. On the down side, it's another game where the price tag may be more than what one should really play. I'm not going to judge this just yet until I see more definitive material. Was OFLC Rated not too long ago, also. They're the same ones responsible for overseeing Fritz Chess. "This is an interactive board game in which players earn points and progress through levels by participating in a series of challenging mini-games. Mini-games include trivia, math and spelling, puzzles, hidden word challenges, and memory games." Not impressed. Unless I hear it is impressive it might as well go to the bottom of my "to get" list. Wow, two releases in one day, North America is truly spoiled; the Japanese are only getting five releases tomorrow...tsk tsk. Truly an AAA WW title there. I know it is only one screen shot but honestly 3 + 1? why? If you are old enough to play with a wii you know what 3 + 1 is easily. Sorry but I'm with Metroid133. This is at the bottom of my list. @KnucklesSonic8 - This game has popped up on our radar before when it received ratings. We emailed them several times but to date have had no reply. We got the crappy little screenshots you see today directly from Nintendo! This sounds like either a rip off Mario Party or a cheaper alternative. Either way, I probably won't get it. @Awesome 5: Sounds like it has more in common with TV Show King. STILL waiting from Gradius Rebirth. How foolish of me. We got the crappy little screenshots you see today directly from Nintendo! Do you know why Nintendo feel the need to give websites postcard-sized screenshots. I know they use the same screenshots on the Wii shop but to make these screenshots they would need proper ones. To be honest I like to think of this update as vengence for the people who laughed at Europes update on Friday. The biting question for me is; Will this title join the 18 out in America but not coming to Europe? Another party game for the Wii... sigh. And another generically titled one at that. Yesterday I saw a Wii game called "Game Party" ... yeah. How original. Granted it was the bargain rack at the Office Depot, but still. What were you doing with your pants down anyway, WiiWare World?!?! Am I the only one who noticed the developers are 1 letter offf from "gimmick". G a mmick. G i mmick. See. I already have no hope for this. This game title epitomizes every complaint that people have about the Wii. Alright! It's been awhile since we had some surprise garbage! Am I the only one who thinks that dude in the screenshot is creepy? Like, kill you in your sleep creepy? Don't worry guys! We'll probably get Gradius Rebirth before we hit 100! Awesome. I'm soooooo going to buy this as soon as I've got every sinlge other game on WiiWare. This is such a huge dissapointment. I was so hoping for either Equilibrio or Bit Trip Beat. This game looks terrible. Only plus side is the 8 player support. it isn't very good that the publisher's name sounds like "gimmick" either. Now let's bet which will be worse: This or that Aksys Family Pirate Party game. I wonder why they are scaling back the Wii Ware titles to one a week? I think its time Cave Story and Gradius R come rock Wii Ware's world. I noticed that two the first time I was reading it, I just forgot to comment on it. I wonder if this is supposed to be a spoof of some sort... nah, that's wishful thinking, just more shovelware. The brain games were fun and they had "challenges" like the math and such here. Maybe we'll get lucky. Hopefully I'll like that Ogre Battle. I owned the psx version, but I didn't play it for maybe so many minutes. Didn't get into it back then I guess. What a disappointment, I really was expecting something interesting today , I don't care about this game, I'm a lone player, and I bet this ain't gonna be the best party game anyway; seriously 3 + 1? This is as casual as any game can get . What in the hell is this?!!! I was NOT expecting to find this when I logged on. It looks like we have a very very good contender for worst WiiWare game of all time. I don't think I've ever been this disappointed since WiiWare launched. This better not ever make the top 20 list or we are all doomed. Man.. I wanted Bit Trip: Beat and swords and soldiers. Oh well. im tired of all this useless crap. February was an awful download month! Where the [email protected]#$ is bit trip beat and bubble bobble?! You guys are too quick judging a book by it's cover, just wait till the review confirms this is AAA, specially since it's coming from the awesome Spanish developer Gammick Entertainment. They are publishing Little Red Riding Hood's Zombie BBQ here in Europe. Sorry, I'm reviewing Ogre Battle this week. I'm not quite sure what to think of Family & Friends Party yet. Like you, I might just wait and see what the review says. Its not my kinda game but I do think Ogre Battle deserves more than 7/10. The graphics look like a kiddy educational game. That will catch us all off guard. No, we can't do that! We already expanded the ratings scale to 10! Doing that would practically make it a 100 scale! But don't we usually have these reviews out before the game gets released on VC? Virtual Console game reviews on VC-Reviews.com will now come out the day after they are released. New policy. Just wait, this game will easily crack the top 10. It has the perfect title to entice people that have no clue otherwise - "Family and Friends Party". This is what people buy, apparently. @Corbie: If Dracula comes back for every Castlevania, why cant the number 7? "Sevenvania: Play as Corbie Dillard as you trek through his awsome house, beating high scores on very expensive arcade machines, in an attempt to beat Seven, his best friend turned to the dark side after repeat use." Weird how the vid on the NC shows Teen rating when it's not... If you don't believe me still then check ESRB. @Popy: I'm aware of Dokapon Kingdom and the upcoming Dokapon Journey already, thanks. I'm just not into the whole magic aspect of it. @PALGamer: Yes, people pass judgments here WAY too quickly but you should be used to that. I'd hate to see Gimmick... I mean uhh... G*a*mmick (Bahamut, I caught that ages ago. XD) get discouraged from developing future WiiWare titles. I could actually see this game getting a solid 5 or 6. Not exactly a 'gotta-have' title or anything but I bet it does what it tries to accomplish. Kinda like Yummy Yummy or Major League Eating or Potpourii. Hey, whats with the picture change? I assume it was changed because the creepy dude at the title screen makes small children and adults alike cry in fear. I'd better see some royalty checks from Sevenvania! I down loaded this because I play a lot of the party games and it is pretty average. The graphics, music and overall presentation are bland and generic. 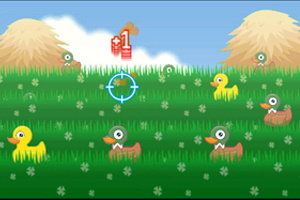 This game can be played with two to eight players, so as stated there is no single player here. However, this is a party game, so I don't think the lack of a single player option is a deal breaker. This game has a two vs the computer option, a three player option and then a team based option for up to four players per team. In the team mode, each team takes a turn and then every other turn the teams battle it out at the same time. There are six activities (from what I remember) ranging from word based games to pictionary and shooting games. The games play okay but they are not going to blow anyone away. When a team succeeds at an activity, they win coins and aquire the badge for that accomplished game. First team to complete all of the activities first, wins the game. The coins come into play in that you can buy a badge out right for a large amount of your coins, or pick a game to play where you still need a badge for a lesser amount of coins. This works pretty well and gives a purpose for the coin collecting. Miis are supported in this game which is a nice feature or you can use the generic characters that are already available. Overall it is a pretty average game but if you like party games, you might have some fun with it. I didn't see an option to play the games individually in a practice or quick play setting. This is a little disappointing as a few of the games are fun and a quick play option would add some replay to the package. You can play it by yourself, it's just pointless since you're cheating on two of the games...or you can give yourself a detriment...but it is possible to play by yourself entirely. It does seem that our last update was too good to be true. Now we get to (Start to) pay for it. Tactics is probably pretty good if you like the genre and this game probably just isn't good ,especially costing 1000. If it was 500, it'd be hard to fail completely at being an average Mario Party rip-off for the family to play. @Pablo: Glad you're enjoying it even a little. What else do you have to say for it? Worth 1,000? How's the board set up? What are some issues you have? What are some things the game does right? Are the activites fun? TBH, I would LOVE to play the Pictionary parts. How are those since we're on the subject? Apparently the others have to turn around while the other team guesses the object. Doesn't sound that bad at all. I'm just wondering how the execution is and if I should wait for a better rendition of these types of games (that I admittedly love). @gameking23: SO WAS I!! lol. I was disappointed 2 weeks in a row, now. Oh well. Let's hope for next week. Oh and SatBK out tomorrow! lol. Had to say it. @KS8-For the most part all of the games work well and that is why I am surprised that there doesn't seem to be any quick or free play mode to play just the games you like. There is no board like in the Mario Party games. There is a crane that picks games at random and that is the game type that your team will play. This is where the coins come into play, as they allow you the ability to pick a game that you need instead of a random one. The Pictionary type game works fine but as with all of the other games, they are set up in quick bursts, so you never fill like you get enough time with the games that you like. I can't say that there was a game that I hated, as I like word, drawing and shooting games. My problem with the game is the very low production values. I don't expect a work of art for 1000 points but this game feels cheap, through and through. If you love party games, have people to play the game with and can get past the generic look of this game, you can have some fun here. As to whether it is worth a 1000 points or not, I still don't know. EDIT:I should mention that although this may look like a kids game, a good portion of the questions would be too hard for younger children. There are math questions that have very simple solutions, however the goal of that game is to get the answer before the other team. Also, the word games can be a little tricky, such as spelling a word backwards, or guessing a word based on a simple clue. The Simon Says and Duck Shooting are two games that pretty much anyone can do though. And yeah, the production values are obvious to anyone really.